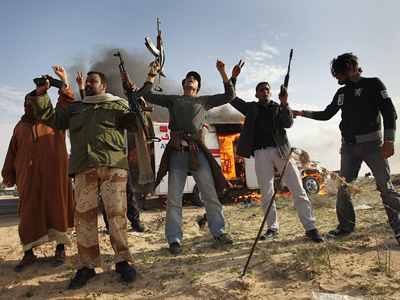 Inflamed violence continues to tear through Libya, more than three weeks after protests erupted. However, some believe that mainstream media outlets are way too one-sided in portraying the events in the country. Benghazi-based rebel National Libyan Council confirmed on Tuesday that Muammar Gaddafi had talked to them, bargaining for an opportunity to escape the country, Reuters news agency reports. A source in the council told the agency on Monday that Muammar Gaddafi had offered to hand power to the head of parliament and leave Libya with a guaranteed sum of money. The council did not confirm the proposal on Monday, but on Tuesday announced that it had been, indeed, made. 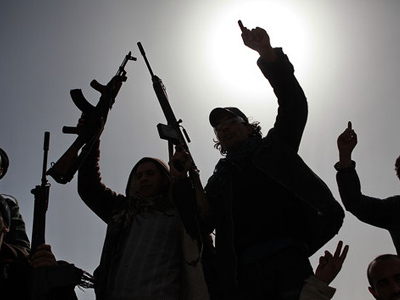 National Libyan Council’s spokesperson Mustafa Gheriani told the agency that the rebels rejected the deal. The Libyan government denied having talks with the council, Al Arabiya television reported. It also quoted Libya’s Foreign Minister as saying that the allegations of the National Libyan Council did not deserve a response. Muammar Gaddafi’s supporters are currently moving eastwards in order to reclaim towns which they lost during the popular uprising, Al Jazeera television has reported on Tuesday. 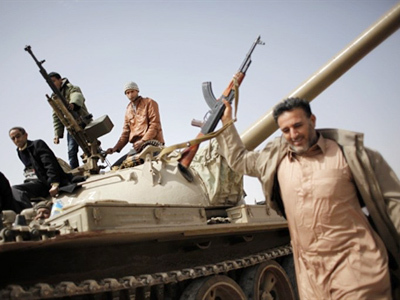 According to the channel, pro-Gaddafi forces have retaken the town of Bin Jawad in central Libya and moved on to the oil port of Ras Lanuf. However all of these reports have been rejected by Gaddafi himself on state television Tuesday, although the opposition is still keeping its hopes up, coming forward with a new proposal: if Gaddafi were to step down now, they would not seek prosecution through the International Court of Justice. In the meantime, the US administration and Barack Obama have confirmed that the US is still considering military intervention in Libya. Amid all the controversy surrounding the possible military intervention, Robert Gates, the US Secretary of Defense, was caught joking about a possible attack on Libya with General David Petraeus upon his arrival to Afghanistan Monday. “Yeah, exactly,” responded Gates with a hearty laugh. Both were apparently unaware that their friendly chat was being recorded on a microphone. The international media is now guessing whether that remark was just a joke or whether there was some truth to it. Ivan Eland, a Senior Fellow and Director of the Center on Peace & Liberty at the Independent Institute in Washington DC, does not believe that Robert Gates and General Petraeus were, indeed, serious about the military action. However, he agrees, it was a bad joke. “In fact, Gates was one of the people who’ve been saying, ‘Hey, let’s not do the no-fly zone, because this would entail attacking a country,’” Eland added. The official position of the US is that in order to decide on a military intervention they need support from the international community. UN and NATO are still weighing in on the possibility of declaring a no-fly zone over Libya. However, a vote on a no-fly zone could be hard to secure at the UN Security Council where China, a permanent member, is very cool to this proposal and Russia has made it clear that any foreign military involvement would be unacceptable. ­Anti-war columnist and historian Nebojsa Malic from Washington DC says the situation with Libya resembles the build up to previous US interventions. ­Michael Hughes, a Seattle-based journalist for the Huffington Post, says the US should not intervene. The US media and the government, Hughes continued, have the perception that Gaddafi is a complete monster, and by portraying him this way they are looking for excuses for a possible intervention. However, such a scenario could drag the United States into another “Afghanistan,” the journalist explains. “If we intervene, theoretically we are going to be intervening on the side of the Islamists once again. There we go… Afghanistan again… We need to stay out of this,” Michael Hughes concluded. 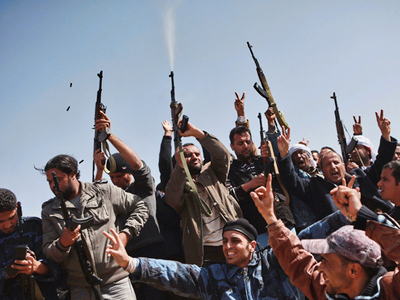 ­Author Tim Gatto says the US could be using the humanitarian issue as an excuse to invade Libya. “What they are doing is they are saying that Gaddafi is killing all these people, you know, all those rebels and civilians on the ground, and they want to use a humanitarian excuse to invade Libya,” Gatto said. “Meanwhile, in Darfur there’ve been people dying left and right and you haven’t heard anybody say they want to send a military force to Darfur, because Darfur doesn’t have oil,” Tim Gatto continued. “I think that the United States and Britain and France are going to use this as an excuse to re-colonize Libya and take their oil." The death toll is rising in the country with several people killed in Monday battles, the source said. It is not completely clear now who is in control of which territories. 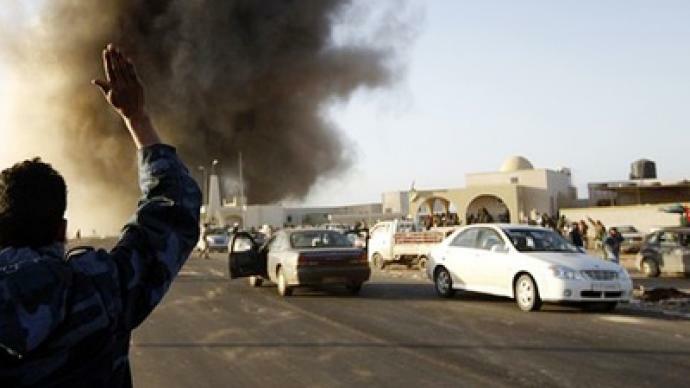 Al Jazeera earlier reported bombings in the Libyan capital. However, people on the streets of Tripoli say that media coverage of events is far from objective. “They told us that Tripoli is bombed by [the] air force and heavy guns or something like that. It completely is not the truth,” said spokesman of Libyan Culture Ministry Abdul Lamushi. CNN reports suggest that Tripoli is facing gunfire, explosions and fighting with war planes firing at protesters. However, RT correspondent Paula Slier, who is currently in Tripoli, reports a completely different picture. According to Paula, the city looks more like it is going about its everyday business rather than being on the brink of war. “When we invited foreign media to come to Tripoli and to Libya, and to see and to watch and to send their reports to their channels, we noticed that the administration of their channels selected what they want from these reports and eliminate what does not serve their purposes,” Abdul Lamushi explains. Some people in Tripoli are angry with such state of affairs. Mohammed has taken a few days off from his work as an engineer to join the throngs of Gaddafi supporters in downtown Green Square. However, analysts say it is not just what is being hidden, it is also what is actually being said. Paula Slier says the war is clearly not in Tripoli and, just as clearly, Western media has been a little too quick to write off Gaddafi. 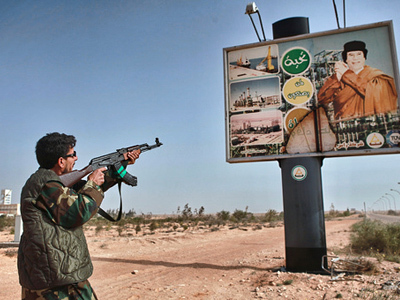 Both sides have their propaganda war and Tripoli is now under fire in this information battle. ­According to Asia Times correspondent Pepe Escobar, mainstream media hype is all about supporting the West’s urge to establish its control over the region. 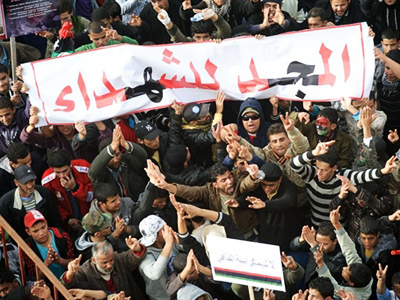 ­Still, there is no opposition force in Libya strong enough to create its own political agenda, believes Barah Mikhail, a Middle East expert from Fride – a Madrid based think tank for global action.